This reclining loveseat's casual and comfy style and quality construction makes it a piece of furniture that's tough to beat. Thickly padded, full-length chaise cushions provide incredible support for your legs, paired with equally-plush neck support cushions and pillow arms. Available in power or manual recline. Power motion recliners are now available with a built-in USB charging station, helping you keep your phones and devices charged and easy to reach. 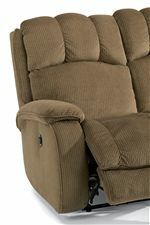 The Huron Casual Power Reclining Loveseat with Plush Padded Arms and Headrest by Flexsteel at Jordan's Home Furnishings in the New Minas, Halifax, and Canning, Nova Scotia area. Product availability may vary. Contact us for the most current availability on this product.